This weekend, several of the most widely circulated newspapers in the United States found themselves the target of a cyberattack that reportedly originated on foreign soil. Many questions about the attack remain unanswered, but one thing is certain: the media is under attack — and if something isn’t done to protect it, we could be headed toward a future in which we can’t believe anything we read. 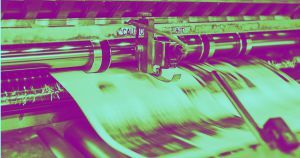 The malware prevented editors from transmitting pages of the papers to printing presses, and it delayed the scheduled printing and delivery of the Saturday editions of several newspapers, including The New York Times and The Wall Street Journal. Nobody is sure of the source of the attack, but several people with inside knowledge of Tribune told The Los Angeles Times that the attack appeared to be Ryuk ransomware. Experts have linked this software to groups in North Korea and Eastern Europe, but for now, all The Los Angeles Times has confirmed is that the attack appears to have originated from outside the U.S.
As the name implies, ransomware attacks are typically financially motivated — attackers disrupt a company’s operations and demand a ransom to end the disruption — but neither Tribune Publishing nor The Los Angeles Times has reported any ransom demand. An anonymous source told The Los Angeles Times that the attackers didn’t appear to steal any information either. That means a likely motivation behind the attack was preventing newspaper readers from getting their news — and that is highly troubling. Just this month, the majority of Americans admitted for the first time that they prefer to get their news from social media platforms than from traditional print newspapers. While the latter sources are held to journalistic standards that place a premium on fact-checking and context, the former are notoriously rife with misinformation and bias. If foreign actors are able to further cripple the U.S.’s already vulnerable newspaper industry by literally preventing the printing of newspapers, the “fake news” that dominates our social media feeds could one day overshadow the real news — and we’ve already gotten a glimpse of the disturbing impact that can have on a democracy. The post Foreign Cyberattack Cripples Major U.S. Newspapers appeared first on Futurism.